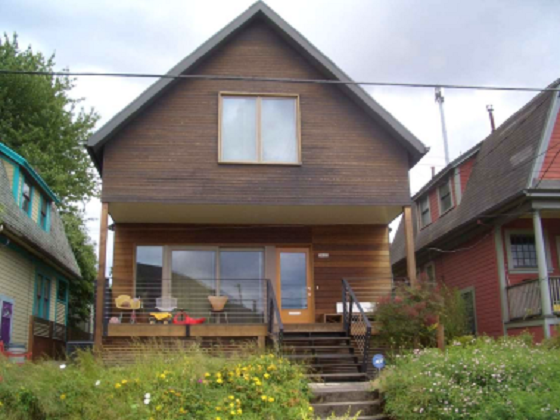 The outward appearance of the Portland, Oregon home shown above seems normal, but its zoning designation could make the property impossible to finance conventionally, and a nightmare to appraise. A typical real estate appraisal scope of work includes a zoning review, but just what are appraisers looking for when they check zoning? 1. What uses are legally permitted on the subject site? This could include uses that are legal if the existing home or building is removed or converted. An example would be a single-family residence could legally be rebuilt or converted to a duplex. 2. What uses are physically possible on the subject site? This could include uses that are possible if the existing home or building was removed or converted to another use. It may be that a duplex is legally permitted, but it is not physically possible to fit anything larger than a single-family home on the site with off-street parking requirements for the duplex. 3. What uses are financially feasible on the subject site? For example, if it costs $50,000 to convert a single-family home to a duplex, but only adds $20,000 in value, then converting to a duplex would not be financially feasible. Conversely, if it costs $20,000 to convert, but adds $50,000 in value, then it would be financially feasible to convert. 4. What uses are maximally productive on the subject site? For example, if a single-family home has a value of $200,000 on the site and a duplex would have a value of $250,000 minus a $20,000 conversion cost (including investor profit), then the highest and best use would be a duplex. Therefore, when appraisers check zoning, they are usually looking to answer the question, “What uses are legally permitted on the subject site?” A list of questions follow that we try to answer on a typical home appraisal, so that we can move to the next step in resolving highest and best use. 1. What is the zoning designation? A common Portland, Oregon example is R5 or Residential 5,000 zoning. 2. What kind of uses does the current zoning allow? With Portland’s R5 zoning, houses, attached houses, accessory dwelling units, duplexes, and manufactured homes are the main allowed uses. 3. Is the subject property’s existing use an allowed use? If the subject’s existing use is not allowed, can it be rebuilt if destroyed? If a house cannot be rebuilt, few lenders will loan on it and therefore the existing home may have little value or even negative value (cost to remove). It is rare that a zoning will not allow rebuilding of a legally built home, but I have come across this on occasion in Portland, OR appraisals. 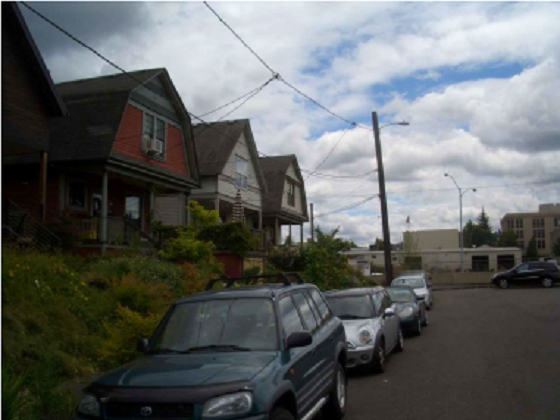 This is a row of homes in NW Portland, Oregon that are on General Industrial 1 land and cannot be rebuilt if destroyed by more than 75% according to the person interviewed at the City of Portland Planning and Sustainability Department. The photo at the top of this blog post is also from this row of homes. The lots are too small to have many feasible industrial uses and the homes are too valuable to be feasible to demolish for industrial purposes (at this time). 4. Does the subject’s site size meet the minimum lot size requirement? Portland’s R5 zoning has a minimum lot size of 3,000 square feet (in most cases). If the subject lot is only 2,500 square feet, the appraiser should verify that this property can be rebuilt if destroyed, despite the nonconforming site size. 5. Does the subject’s site size allow for additional development density or subdivision? For Portland’s R5 zone, typically the development density is one residential unit per 5,000 square feet. Therefore, in most cases, 10,000 square feet would be necessary before subdivision is a possibility. If the lot has more than 10,000 square feet, you may have a situation of Appraising a House with Extra Lot. If you find this information interesting or useful, please subscribe to my blog. Also, please support us by making Portland real estate appraisal related comments on our blogs and YouTube videos. If you need Portland, Oregon area residential real estate appraisal services for any reason, please request an appraisal fee quote. We will do everything possible to assist you.